The teaser of Superstar Rajinikanth's Kaala is all set to be released on March 1 2018. The announcement was made by actor Dhanush, who is also the producer of the film under his banner Wunderbar Films. The teaser would be released by Wunderbar Studios, the record label and online video channel of Wunderbar films, in association with their digital partner Divo. 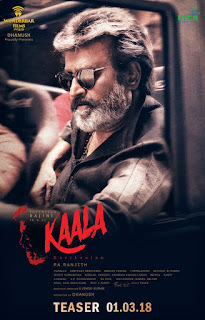 Kaala a multilingual film being released worldwide in association with Lyca Productions on April 27 2017 is directed by Pa. Ranjith, who was also the director of Rajinikanth's previous blockbuster release Kabali. The movie has a multi star cast which includes Nana Patekar, Huma Qureshi, Samuthirakani, Anjali Patil, Sayaji Shinde. Music is by Santhosh Narayanan and more updates about the audio release will be expected after the teaser release. Speaking on the association, Shahir Muneer, director of Divo, said that its the 8th project Wunderbar Studios and Divo are working together since their first collaboration started in 2014. Dhanush's Wunderbar Films is a trendsetter in setting a new industry model especially in regional cinema, where as the producer he has been consistently monetizing the audio, online video rights without needing to sell the copyright/IP with help of distribution and digital partner Divo. This has resulted in Wunderbar realising one of the highest subscribers, followers and reach on online and social media. Shahir further commented that the digital assets of Wunderbar in 2017 had a combined viewership of 500 million plus which is among the highest in India for a regional film producer.